This photo taken on April 7, 2018 shows workers lifting a toppled statue of China's first emperor "Qin Shi Huang" in Binzhou in China's eastern Shandong province. A strong gale force wind has toppled a giant statue of China's first emperor Qin Shi Huang and flattened its face at a popular tourist site in eastern Shandong province. AFP. BEIJING (AFP).- A strong gale-force wind has toppled a giant statue of China's first emperor Qin Shi Huang and flattened its face at a popular tourist site in eastern Shandong province. 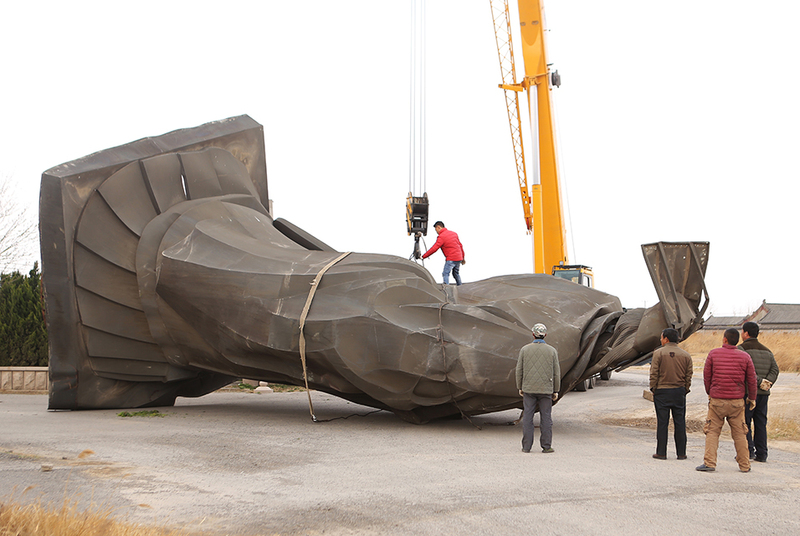 The 19-meter (62-foot) bronze replica of the monarch -- who was the first to unify warring factions in China and established the Qin dynasty (221-206 BC) - was blown out of its pedestal on Friday. Cranes were immediately called in to pick up the statue, which weighs about six tonnes, according to the state-run People's Daily newspaper. Photographs showed the structure was hollow, with metal bars inside. The monument was built in 2005 to attract visitors to a local tourist resort.